All age group placers may pick up your official "Run with Ryan" cinch bag and Ragged Mountain winter gloves beginning November 1st at the shop. Thanks to the University of Virginia and Dana Thiele for the photos! Thanks, friends and neighbors for participating in the first ever Community Bridges 5K! Your support meant so much to President Ryan and to the many service organizations, who will benefit from the $25,000 we were able to donate to the CNE. Our goal was to take some strides, no matter how small, towards bridging our community. We think, thanks to your overwhelming support, we were able to do just that as over 1500 of you joined together, on foot, as we celebrated through the wonderful neighborhoods of this historic new course. 1. All age group placers may pick up your official "Run with Ryan" cinch bag and Ragged Mountain winter gloves after November 9th at the shop. 2. Those who did not receive their shirt may also do so after November 9th at the shop. We thank you for your patience. 3. Just started running or walking and would like to go beyond the 5K distance? Then please join me for the Charlottesville Track Club's popular 10 Miler Training Program and Men's Four Miler Training Program starting this Saturday. I do hope you enjoyed the event as much as we enjoyed preparing for it. On behalf of our wonderful race committee and President Ryan, I thank you for joining us for this historic debut event. Let's do it again next fall! ​p.s. A call out to Dana Thiele for the wonderful race day photos. 2. Right on University Ave.
4. Right on Wertland St.
6. Left on W. Main St.
9. Left on West St.
11. Left on Gordon Ave.
12. Left on Rugby Rd. 13. Cross University Ave to McCormick Rd. 14. Finish on Amphitheater Way/McCormick Rd. Welcome Community Bridges Runners and Walkers! I speak for President Ryan and our entire race committee when I say we can’t wait to host you on Saturday for this historic community event. You will be joining over 1500 of your neighbors in celebrating Jim’s inauguration, while making this the largest debut footrace we’ve ever had in our community. On behalf of the University of Virginia and the Charlottesville Track Club, I thank you for being with us to celebrate this special occasion and wish you a safe and enjoyable run with Jim and his family! Pre-race day packet pickup will be held this Friday from 6:00–8:00 P.M. at John Paul Jones Arena (JPJ), 295 Massie Rd, Charlottesville, VA 22903. All participants who registered before Wednesday will receive a commemorative shirt at packet pickup. If you registered after, you will be able to pick up your commemorative shirt next week. If you or a friend cannot get over to JPJ to pick up your race bags, you may pick them up on race morning from 7:00–8:15 A.M. at the Aquatic & Fitness Center (AFC), 450 Whitehead Rd, Charlottesville, VA 22904. During packet pickup as well as at the awards ceremony, guests are invited to participate in two donation drives. Running shoes will be collected for a community shoe drive, and nonperishable food items will be collected for the Blue Ridge Area Food Bank. We encourage you to participate in these activities as part of the Celebration of Service. Participants in service activities will be eligible to win a variety of prizes (see below). 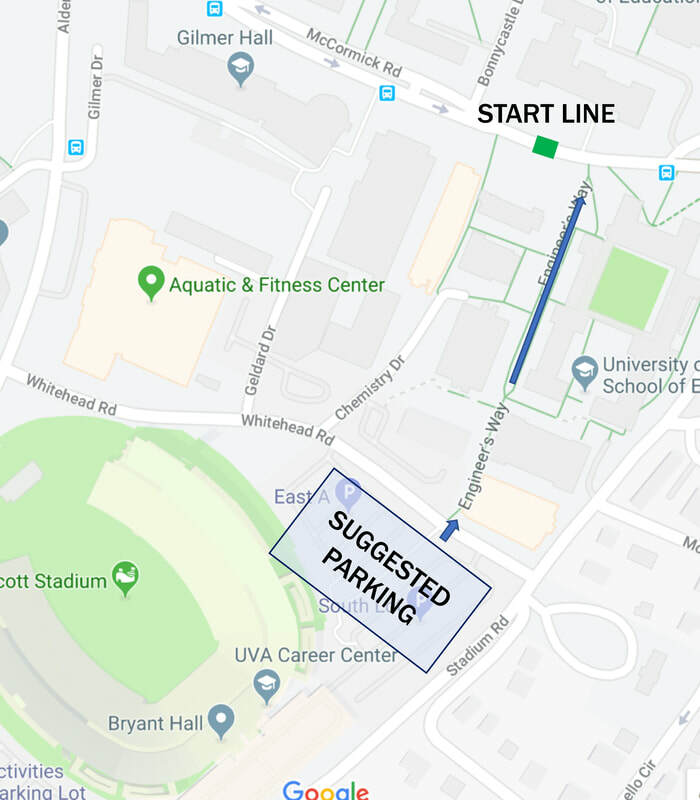 Free race day PARKING will be available at Scott Stadium. The closest lot to the race start is the one next to Rice Hall at the intersection of Stadium Road and Whitehead Road; there are a variety of easy-access approaches to this lot (see map). RESTROOMS will be available on race morning in the AFC. In addition, we will have 35 port-a-johns along Engineer’s Way and next to the starting line (see map). We will also have several behind the McIntire Amphitheatre at the finish. The STARTING LINE is located directly in front of the Physics Building on McCormick Road; the most direct way to get there from the parking lot is to take Engineer’s Way. Because it’s supposed to be quite chilly on race morning, we will have a van available at the starting line for you to leave your warmup clothing. Your apparel will then be transported to the Amphitheatre, where it will be available for pickup after you finish. We will begin lining you up for the start on McCormick Road, at 8:45 A.M. There will be pace group ribbons, including a section for those of you who wish to walk the entire way. Please position yourself in the appropriate pace group, as this will assure a smooth start for everyone. You must wear your race number on your front and clearly visible, as that’s how the chip works. Our two UVA alumni and 1988 OLYMPIAN GUEST STARTERS, Margaret Groos and Paul Ereng (see below), will start the event by each waving a UVA flag at 9:00 A.M. 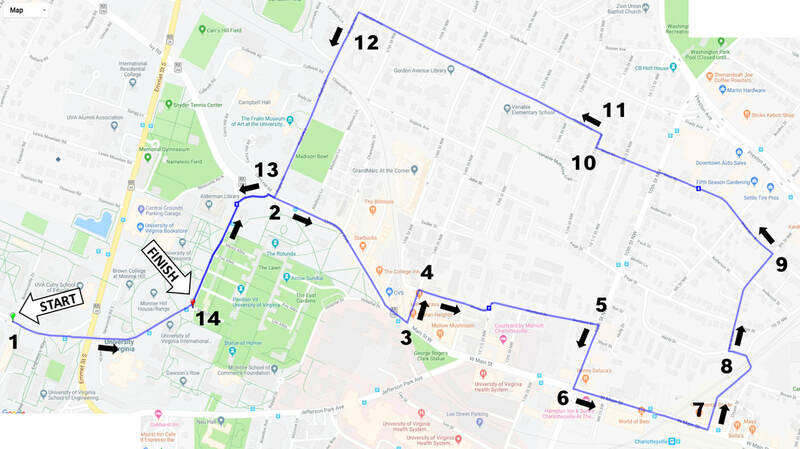 The COURSE will proceed through Central Grounds on McCormick and then make a right turn at the Chapel onto University Avenue. The course is quite challenging with steep uphill climbs at 14th and 10th Streets and a long gradual ascent at Gordon Avenue (at around mile 2.25) but, if you play your cards right by taking advantage of the many downhills, you can make up some serious time. The places to fly are down the Corner, Wertland, 8th (steepest downhill of the entire course) and Rugby. And, to boot, it’s basically a gradual downhill over the last half mile to the finish at the Amphitheatre! (see map for details). When DESIGNING THE COURSE, our primary goal was to link the University with the bordering neighborhoods, in an effort to bridge the communities. President Ryan and the University are committed to strengthening the relationships with their neighbors. This event is a small, but symbolic, effort in staying true to that mission. You will pass over the Emmet Street Bridge while cruising through the University. Then over the Drewary Brown Bridge, named after one of our community’s most beloved civil rights leaders and activists, while heading down Main Street. And then, finally, over Beta Bridge as you head back to Central Grounds. For the first time ever, a community footrace will wind its way through the quaint streets of historic Westhaven and by the City of Promise and the City Garden (at the water stop). And of special note, you will pass through the tunnel under the railroad tracks at 8th street, which is also a first! We hope you enjoy this scenic tour of these iconic neighborhoods. You will be CHIP TIMED and there will be a special clock at the finish that will highlight your name, place and time as you cross the line. Very cool! Thanks to our friends at the Charlottesville City and University Police Departments, plus the help of over 150 volunteers, including the entire UVA Track and Field team, you will be safely guided along this new community course. We will have a WATER STATION at about mile 1.5 in Westhaven. Dr. Wilder and his UVA Runner’s Clinic staff will kindly have the medical covered at the aid station at mile 1.5 and at the finish. Our friends at the City Fire Department will have a surprise waiting for you at the half mile mark and, then again, at 3 miles. Hint: Look up! The AWARDS CEREMONY will start at 10:00 A.M. during a special Celebration of Service to recognize the hard volunteer work of countless community nonprofits. One of President Ryan’s pillars is service and he will be on hand to be a part of this ceremony. Cristine Nardi, the Executive Director of the Center for Nonprofit Excellence (CNE), will also be on hand to accept the donation from the race proceeds. We are very grateful for your generous support of the event. Our two Olympian guests, Margaret and Paul, will then hand out the race awards. Over 100 age group prizes will be awarded in 17 five-year age groups, from 10 and younger all the way to 80 and over. And, as an extra incentive to hang with us at the Amphitheatre at the conclusion of the awards ceremony, we will have FOOD TRUCKS with FREE FOOD for all of the participants…plus, music and prizes (see below)! MARGARET GROOS, who was the first female to accept an athletic scholarship to the University of Virginia back in 1977, won the 1988 U.S. Olympic Marathon Trials in 2:29, earning her the top marathon spot on our U.S. team for the Seoul Olympic Games. She still holds the school record in the 5000 meter (15:51). She now lives in her hometown of Nashville, Tennessee, where she still runs like the wind. PAUL ERENG, was a rising UVA second year when he won the Gold Medal in the 800 meter at the 1988 Olympic Games. He went on to set the world record for the indoor 800 meter with a mind-boggling 1:44 and still holds the UVA school record with a 1:43.18 in the outdoor 800 meter. He now coaches track at the University of Texas at El Paso. Prizes include tickets to a UVA men’s basketball game, to a concert at John Paul Jones Arena, and more.